Practice your golf skills & get FREE ADVICE and drinks from a bunch of hackers! In anticipation of The 2019 GAPABA Law Foundation Charity Golf Tournament on May 16th, Boardmember and Eversheds Sutherland Partner Chris Chan and other organizers will be at the Topgolf Atlanta range EVERY TUESDAY from 5:30 - 6:30 pm until May 14th, hitting balls, having a beer and ready to dispense some advice on your form! JOIN US and practice networking with your golf! Time to #TigerWoods it! BRING YOUR FAMILIES TO ENJOY GREAT FOOD AND MUSIC IN A PICNIC ATMOSPHERE. GAPABA'S UP FOR A SIX-PEAT! We have won our Cook-Off category for the past 5 years! We need VOLUNTEERS to help prepare our table, and plate our submission to the judges. This year, we are doing APPETIZER CATEGORY—once again led by our IRON CHEF Sean Rosario! This event FREE and is open only to young associates and law students who are PAID GAPABA Members. It is limited to 8 guests, first come, first served. 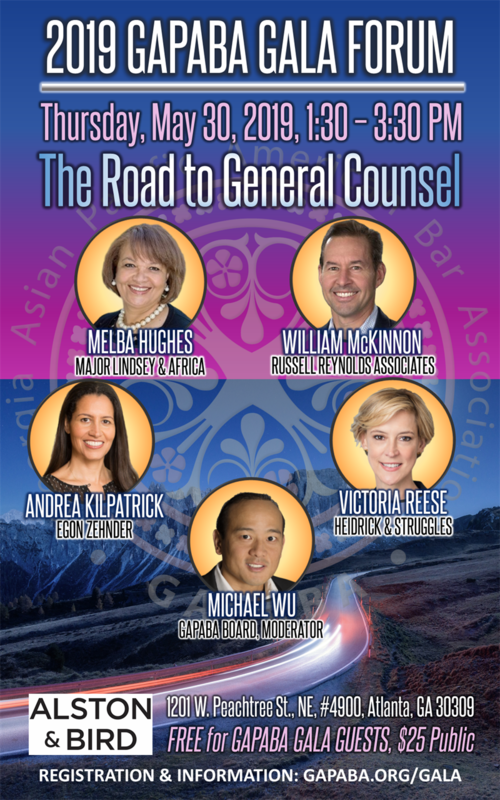 Past GAPABA Presidents Anu Seam, Assistant VP and Sr. Legal Counsel of AT&T and Cherish Dela Cruz, Principle of De la Cruz Law, LLC invite mentees to join them for an intimate lunch, where they will provide guidance and insight as to how they achieved their career path, and their leadership roles. Golf club rentals will be available. SINGLE OPEN GOLF PLAYER - $250: Limited availability; no specification of team preference. DISCLAIMER: All golf tournament sales are final, and should the golf tournament be canceled for any reason, GAPABA reserves the right to reschedule at its convenience. The event will include breakfast and luncheon, with awards. 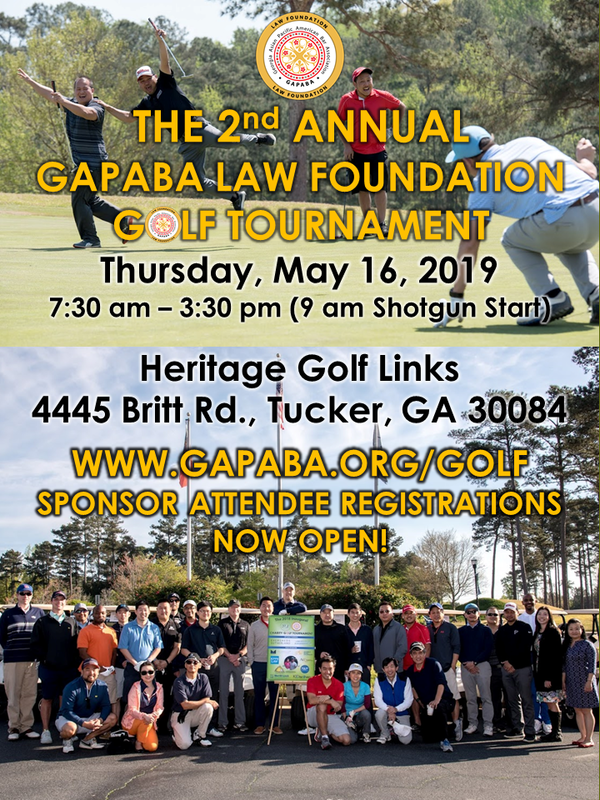 Tournament proceeds will benefit the GAPABA Law Foundation. VIPs/GCs: Please email communications@gapaba.org for REGISTRATION CODE. All 2019 GALA Sponsors, from Diamond to Solo/Small Firm, are allowed five (5) free tickets to this important career development opportunity. Please register by filling out the RSVP LIST and emailing gapababoard@gmail.com on or before May 1, 2019. All Individual Gala guests are also FREE. Please email communications@gapaba.org for the CODE. All NON-GALA guests are charged a fee of $25. NOTE: All Gala Sponsors (according to level) may receive a certain number of tickets to the Gala VIP Reception, Gala Afternoon Forum (The Road to General Counsel) and the Charity Golf Tournament. 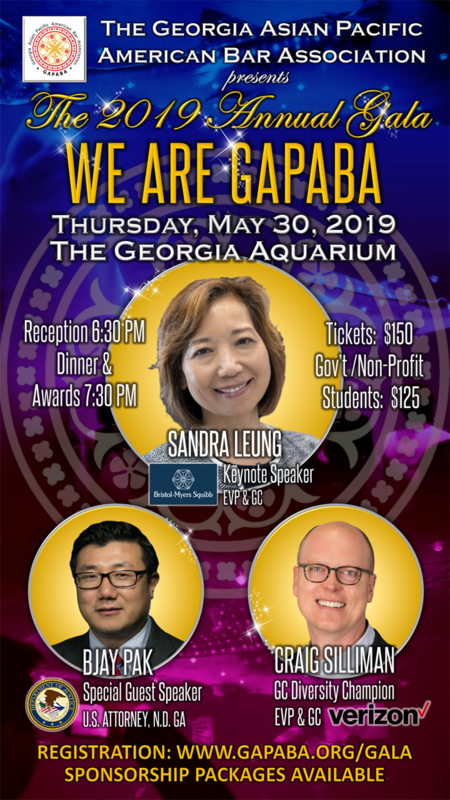 All Sponsors must fill out this RSVP SHEET and email to gapababoard@gmail.com on or before May 1, 2019, to ensure inclusion of all your guests at registration. 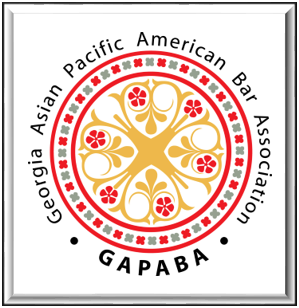 When you enter an event hosted or co-hosted by the Georgia Asian Pacific American Bar Association, Inc. (hereinafter "GAPABA"), you enter an area where photography, audio, and video recording may occur. By entering the event premises, you consent to interview(s), photography, audio recording, video recording and its/their release, publication, exhibition, or reproduction to be used for web casts, promotional purposes, inclusion on websites, social media, or any other purpose by GAPABA and its representatives. Images, photos and/or videos may be used to promote similar events in the future, highlight the event and exhibit the capabilities of GAPABA. You release GAPABA, its officers and directors, and each and all persons involved from any liability connected with the taking, recording, digitizing, or publication and use of interviews, photographs, computer images, video and/or or sound recordings. By entering the event premises, you waive all rights (including economic rights and moral rights) you may have to any claims for payment or royalties in connection with any use, exhibition, streaming, web casting, televising, or other publication of these materials, regardless of the purpose or sponsoring of such use, exhibiting, broadcasting, web casting, or other publication irrespective of whether a fee for admission or sponsorship is charged. You also waive any right to inspect or approve any photo, video, or audio recording taken by GAPABA or the person or entity designated to do so by GAPABA. You have been fully informed of your consent, waiver of liability, and release before entering an event. Han C. Choi, who served as Managing Partner of Ballard Spahr's Atlanta Office, led the firm's Korea Initiative, and was respected locally and nationally for his extraordinary work on behalf of Asian American lawyers and students, died March 26, 2018. Mr. Choi, 52, was diagnosed with pancreatic cancer in April 2017. He was determined to maintain his successful law practice, as well as his active civic and social life, for as long as possible. In the year since his diagnosis, Mr. Choi traveled with his wife, Catherine, and their three children. He was honored by civic organizations he helped build and grow, assisted clients with their business needs, and—as always—participated in activities that enriched the lives of others.